An introduction to different types of habitat. There are many different places where we can find living things. The place that a plant or animal is best suited to and where it is most likely to find everything it needs to survive is called its habitat. A habitat is where a living thing makes its home. 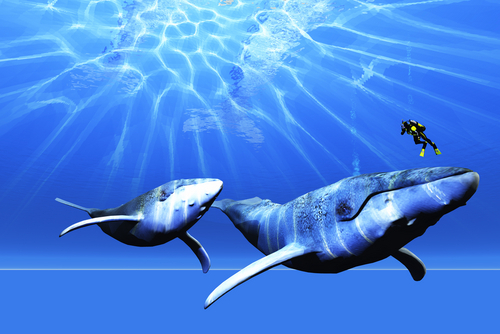 For an animal such as a whale, it can be as big as the ocean, or for a tiny insect it might be the damp soil under a rock. 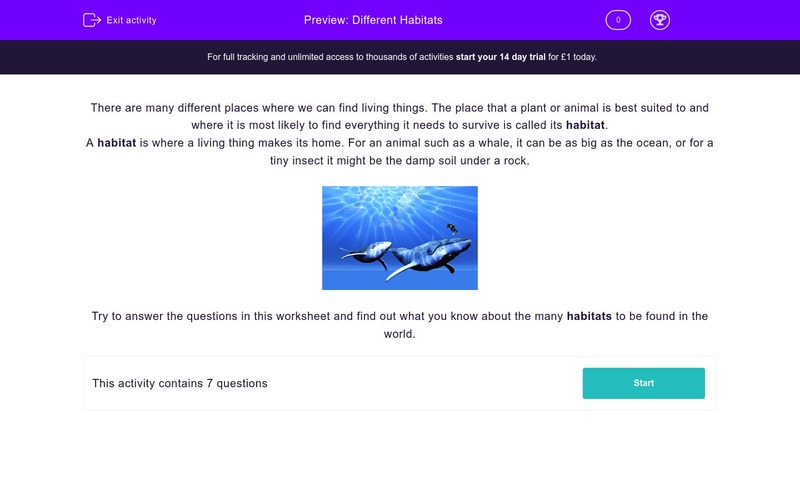 Try to answer the questions in this worksheet and find out what you know about the many habitats to be found in the world. Which of these places is NOT a habitat? True or false, living things can be habitats for other living things. Some habitats are a part of other bigger habitats. Match up the smaller habitats to the bigger ones. Is the following statement true or false? Only one kind of living thing can be found in each habitat. Most living things are suited to one particular type of habitat. In which TWO of these habitats would you NOT expect to find fish? A cactus is a type of plant that has spiny leaves to prevent water loss and a thick stem it can store water in. Which habitat is it suited to? Only the Moon is not a habitat because nothing lives there. Living things can be found in all the other places. It is true. Think, for example, of all the insects and other small creatures that live in an oak tree. The oak tree is their habitat. A habitat can be home to very many different plants and animals. In a woodland habitat, for example, you might find countless insects and spiders, a variety of plant life, birds, deer and other animals. Fish are suited to living in habitats where there is water - so you wouldn't find a fish in a desert or an oak tree. 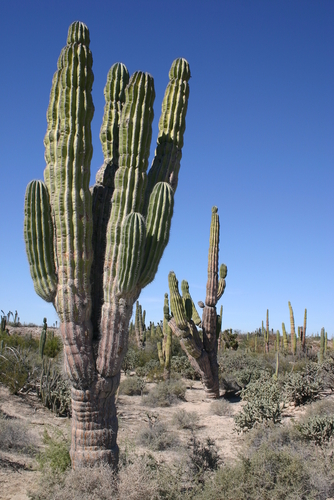 The cactus is adapted to life in the desert where water is scarce and has to be conserved.